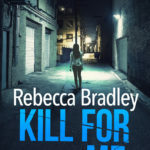 Today I’m giving My Writing Life a miss because I’m sharing the first few chapters of Kill For Me before it’s release on Thursday. It’ll be back next week as usual. Today we are on chapter 4. You can find chapter 3 Here, chapter 2 Here and chapter 1 Here. The three-bedroom semi that Lucy and Faith shared on Peter’s Close, Arnold, felt as though it had no soul when Lucy pushed the front door open. Faith added the soul to the house and right now Faith was supposed to be running about asking what she could have for her lunch. Lucy’s scalp prickled as she closed the door behind her and she was left alone in the hallway. The silence was oppressive, like being under a winter quilt when the sun was shining. She just wanted to get out from under it, but there was no escape from this. Nowhere to go. She had been told to go home and that’s where she was. This was supposed to be her safe space but that had been torn away from her. It was as though the walls were watching her. Her every move stilted and foreign because she was sure they knew what she was doing. She walked through to the kitchen and dropped her bag onto the counter, fished out her phone and texted the number back. She couldn’t simply wait for demands. She needed to push this along. The silence continued. She wanted to claw the hair right out of her head. She wanted to run from the house and not come back. But where would she run to and why was she running? She scratched at her arms as she paced around the small kitchen. The complete silence and lack of Faith in the house was unbearable. Faith, oh Faith sweetie. What is happening to you? This thought slammed into her brain like a speeding train and whipped the breath out of her. Tears flooded her eyes. She hadn’t had time to process what all this meant until she got in the house and time had at last slowed for her to think. Now she had to consider what they had her for and what they were doing to her. It felt as though her insides were being carved in half. She wrapped her arms around herself, bent over and the tears spilled. ‘Faith,’ she wailed. ‘Faith, oh Faith.’ The pain was immense. She was alone and she had no idea who or what was happening to her darling daughter. She had to get her back. Lucy stepped backwards as she cried and she hit the wall with a thud where she allowed herself to slide down to the floor. The tears came relentlessly. Her baby was with strangers and would want her mummy. How could this have happened? Was she cold? Had they hurt her? Where were they keeping her? Did she know she had been abducted or were they still pretending they had picked her up on the say-so of her mummy. Oh sweet, sweet girl. Please be okay and think that Mummy is on her way. Be eating too many sweets and sugary drinks. Be kicking your feet on a sofa and watching a cartoon. Be talking too much about lions and zebras and giraffes. Feel safe and unconcerned. The pain ripped through Lucy like a physical blade tearing her apart. She needed some answers. She couldn’t wait. She picked up the phone again. Swiped at her face. Pushing the tears out of her eyes so she could see the screen. Tapped through to the last call dialled and dialled again. Again it was rejected. She went to the text message and sent another. I’m home. What do you want? Lucy clutched the phone hard, staring at it, willing it to respond to her. To tell her what it wanted from her. It pinged in her hand. She couldn’t open the screen fast enough. What would you do for your daughter? She didn’t even need to think about it. As far as was needed. There was silence. Lucy had the urge to throw the phone across the room and into the wall but it was her only communication with the person or people who had Faith. She had to keep it close. They were talking to her now. They wanted something. She just had to get it out of them what it was they wanted. She would do it. She would do anything. The text message came. Relief swept through her. This must be it. This must be what they wanted. This was her chance to get Faith back. She would do what they wanted and she would get her daughter back. 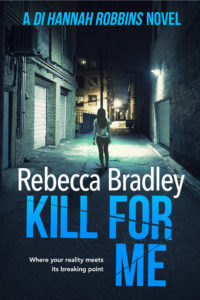 You could stop now, Rebecca for I am committed to reading Kill For Me! Oh, this is really ratcheting up the tension, Rebecca! Well done, and I can really feel for Lucy.